It’s that time again! The Tour de Fleece is upon us, and I am once again hosting a team. 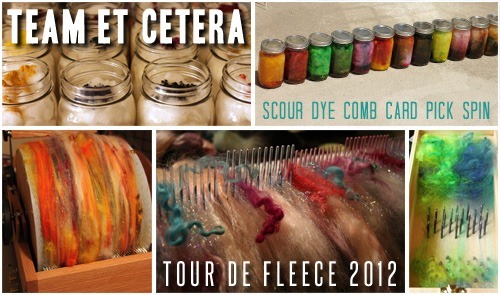 Last year’s Team Tour de Batt was all about carding, and this year I have decided to open it up to all types of fiber prep – scouring, dyeing, combing, drum carding, picking, felting, hackling, and whatever else might float your boat. Team Et Cetera! You’re welcome to join us even if you’re spinning for other teams, and we are very relaxed with the rules, so don’t worry if you can’t post every day. This is just a place to show off all your yummy fiber creations. It will be my goal to card a batt every day of the tour, in addition to some occasional spinning on the challenge days. My store is sorely in need of batt replenishment, so this year’s event can’t come soon enough.